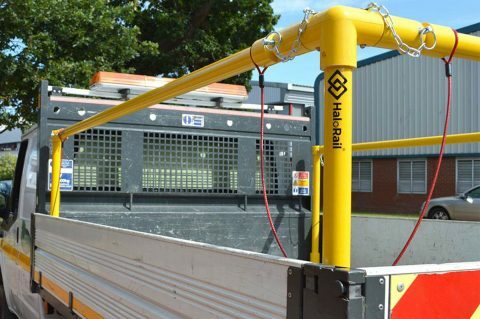 Over the course of the last year we’ve been designing and testing our new product called HaloRail, which is an innovate ‘Fall Arrest’ system for Dropside & Tipper body light commercial vehicles. Clearly any system which helps to prevent a fall is better than no system at all, but many employers will find the least costly route to try and meet their duty of care requirements, which isn’t always the most effective at preventing serious injury to their staff, and ultimately financial cost to their business. For example, a load restraint, or ‘ratchet strap’, is used to create a barrier across the sides and rear of the vehicle by attaching to vertical pillars and the chassis frame behind the cab. However, not only do these straps have a large metal mechanism which itself can cause injury, but they are often left loose which can be worse than if there were no barrier at all. Imagine tripping over in a play park and reaching out for a child’s swing to stop your fall, you’re still going to hit the ground! Now imagine that scenario four feet in the air with no soft landing…! These ineffective barriers are also generally easily removed by the vehicle operator, or manufactured from metal which obviously has a scrap value to any light fingered individual who happens to fancy some quick cash! On top of the risk to life and injury to key staff, there can also be serious financial and reputation implications for a business which doesn’t take steps to protect their operatives. Some costs can be covered by insurance, but rarely to such policies cover every aspect of financial loss. One client explained they had two crews thrown off site because no fall arrest system was installed and the drivers had climbed onto the bed of the vehicle. Not only did they lose that days’ work, but because they didn’t have a replacement vehicle with such a system, they also lost the contract. When asked what that was worth, they suggested several thousand pounds and also the potential loss of that client for future business.